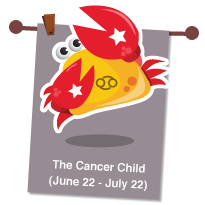 Cancer children are cautious and sensitive by nature and can easily become overwhelmed in noisy, chaotic situations. Be alert about their emotional side as Cancer children are more emotionally vulnerable than most. Family and nurturing is very important to the Cancer Baby, so as parents it is your job to provide a stable home foundation and lots of loving affection to your child. Children born under this sign are positive, tenacious, and love to be noticed. So, be sure to heaps lots of praise on your child for positive growth.